Charlotte Marriott City Center, Marriott Hotels' living innovation hotel, turned to longtime technology partner LG Business Solutions to help renovate and upgrade guest experiences in its collaborative meeting spaces, guestrooms and immersive entertainment and fitness spaces. 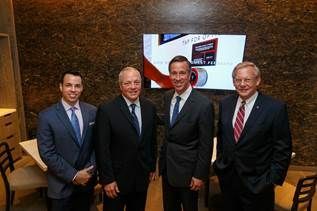 Jake Benner, LG Electronics USA Hospitality Sales Director; Michael Kosla, LG Vice President, Hospitality; Arne Sorensen, CEO, Marriott International; and John Taylor, LG Vice President, Public Affairs. The newly renovated property – featuring LG in-room entertainment, digital signage and even home appliance technologies catering to today's digitally-driven guests – represents an "idea incubator" for Marriott Hotels to test new product and service concepts for adoption across its portfolio. "LG's innovative products have helped us to provide the cutting-edge space and experience that the brand envisioned," said Crissy Wright, general manager of the Charlotte Marriott City Center. "They've been a tremendous partner and supporter for us in our transformation." LG technologies have helped Charlotte Marriott City Center deliver on its new experience in a number of key areas: video walls featuring ultra-slim-bezels along with enhanced LG sound bars transformed the hotel gym into an interactive fitness center for today's modern hotel guest; LG OLED TVs and monitors in the hotel's new M Club Lounge have created a multi-purpose, connected and collaborative public space for guests to work and entertain; and LG Studio premium kitchen appliances contributed to create a communal guest space that has all the cozy comforts of home. "LG focused its hospitality technologies to replicate the digitally-driven experience guests are accustomed to at home," said Michael Kosla, vice president of hospitality for LG Electronics USA Business Solutions. "LG's robust portfolio of products incorporated into this exciting new Marriott property – from ultra-slim video walls in the fitness center to smart LED TVs in each hotel room, and even a full LG kitchen – create an interactive, highly-personalized hotel experience that feels like home away from home." The multitude of LG technologies throughout the property, in both public areas and guest rooms, serves hotel guests from check-in to checkout. As guests arrive in the lobby, they are welcomed by LG's 55-inch class digital signage wayfinding LED screens (model 55SM5B-B) that provide directions and information about the hotel. While guests relax in their rooms, they can enjoy entertainment on one of the property's 450 55-inch LG hotel LED TVs (model 55LY340H), which deliver high-definition programming using LG's advanced set-top box developed for the guestroom entertainment system. These hotel TVs also provide a wide viewing angle ideally suited to the adaptable seating in guestrooms. In the gym, Charlotte Marriott City Center implemented a 3x3 video wall of 47-inch class LG display panels and LG sound bar that offers an immersive and inspiring solution for those looking for alternative ways to stay healthy while on the road. Charlotte Marriott City Center took a bold approach to its meeting and lounge space by creating the LG Studio Kitchen. LG Studio is the company's premium line of kitchen appliances, with design inspired by LG Studio Artistic Adviser Nate Berkus. The suite of built-in appliances in the Charlotte Marriott City Center includes the LG Studio 42-inch ultra-large-capacity built-in side-by-side refrigerator, 36-inch counter-depth three-door French Door refrigerator with LG's Door-in-Door technology, 30-inch double wall oven with LG's exclusive EasyClean technology, TrueSteam dishwasher and built-in microwave oven. Charlotte Marriott City Center's M Club features a 65-inch LG OLED 4K TV; a 79-inch 4K Ultra HD TV for immersive viewing and superior color, contrast, and clarity; and two 34-inch "UltraWide" 21:9 desktop monitors featuring a sleek design, fast performance and a multitude of connectivity options to give guests the tools they need to stay connected and productive on the go.